Haberdashers' Askes' Boys' School crowns Telegraph Hill. The Haberdashers Company, one of the city livery companies, developed their estate centred on Pepys and Jerningham Roads in the last quarter of the 19th century. 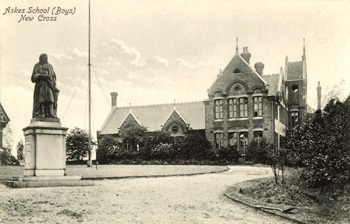 Askes' Boys' School was built in 1875. In front is a statue of Robert Aske, a member of the company, who left an endowment for the company to administer. The partner girls' school at the bottom of Jerningham Road was built in 1891. The girls had until then shared what is now the boys' school.